Deliciously fresh tasting, healthy, and quick to make this easy dish is great for a quick week day meal and more than good enough for company. The cooking time for this dish will depend on the size of your shrimp. When buying the shrimp the size is called a “count” – the number of shrimp in a pound. I used a 35 – 45 count frozen shrimp or prawns as the larger shrimp are sometimes called. Shrimp are cooked as soon as they turn from translucent to pink. Although I really prefer the flavour and texture of using raw shrimp in this recipe, you could use cooked shrimp for this recipe – bake the sauce until very hot and bubbly and then stir the cooked shrimp in and bake only a few minutes longer to heat the shrimp. Shrimp that are overcooked become quite tough and chewy – not good. 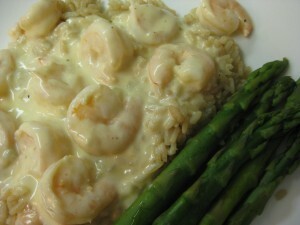 Do not thaw the shrimp before you are ready to make this dish. A quick soak in tepid water thaws them very quickly and if left uncooked for too long after they are thawed the flavour deteriorates. Frozen shrimp come peeled and unpeeled. The unpeeled ones are usually split along the back and very easy to peel even when just partially thawed. A good job for the kids. The spices in the sauce make it very “Greek” tasting. If you are not sure about the spices, add half the amounts first, taste and then add the rest if you like. 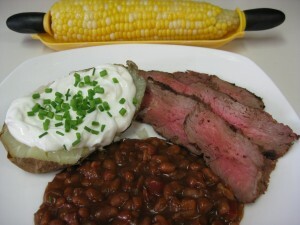 Fresh dill makes this dish – if you can’t find it you can use dill weed. Do make sure that the dill weed smells like dill and has a distinct dill taste. Dill weed can get too old and lose its flavour easily. If you don’t like dill, you could use chopped fresh parsley and still have a delicious dish. Kalamata olives taste better if you buy the unpitted ones and pit them yourself. This is easily done by pressing the flat side of a knife on the olive. The olive breaks in half and the pit is easily removed. Since you don’t need to use a sharp knife kids can do this job. A note re feta cheese: I discovered that I could freeze feta cheese. Sometimes I don’t have an immediate use for the leftover feta so I decided to try freezing it – whole and in the liquid. It worked. The cheese was fine – maybe a little softer but it still crumbled beautifully and tasted exactly the same as before freezing. ½ tsp. allspice – don’t leave out!! 1 – 2 tsp. brown sugar – add 1 then taste, etc. In large sauté or frying pan, cook onion in olive oil over medium to medium high heat until onion is softened but not browned. Add garlic and spices and cook about 1 minute. 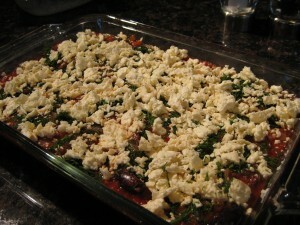 Add diced tomatoes with juice, olives, and brown sugar. Simmer uncovered, for about 20 minutes to reduce liquid and blend flavours. Taste for seasoning and add salt and pepper to taste – keep in mind that the feta will also be salty. In 2 quart glass or ceramic shallow baking dish place prawns in single layer. Pour hot tomato sauce over, sprinkle with feta and dill. Bake at 350 F until just cooked through, 18 to 20 minutes. Serve sprinkled with more dill. May be served as is with bread, over rice or tossed with linguini or other pasta. Note: You may use already cooked prawns BUT reduce time in oven to just long enough to heat prawns through or they become tough. I really prefer the flavor and texture of using raw shrimp/prawns. I am a cook who uses the slow cooker very selectively – some recipes just come out too bland, colourless, mushy and generally lacking “something”. This pot roast is none of those things. The meat is tender and the gravy rich with flavour. It goes together quite quickly especially if you use the oven method to brown the roast. I have found it not really necessary to brown the roast – it comes out just fine! 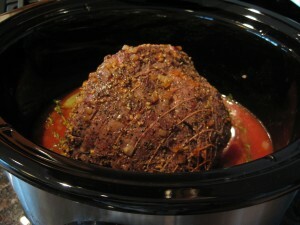 To brown or not to brown meat when using the slow cooker?!?!?!? More browning should mean more flavour. I’m not sure it makes that much difference in the flavour. One of my criteria for a slow cooker recipe is the ease and speed of putting the recipe together. If browning puts you off the recipe – don’t do it. Simply carry on. I came up with a quick oven method for sealing and browning the roast which I’m quite happy with. Ready for browning in 500 F oven. Ready to simmer for 8 – 10 hours. Any pot roasted meat will dry out quickly if left without any gravy or other liquid on it so try to avoid cutting the roast until ready to serve or place back in the gravy. 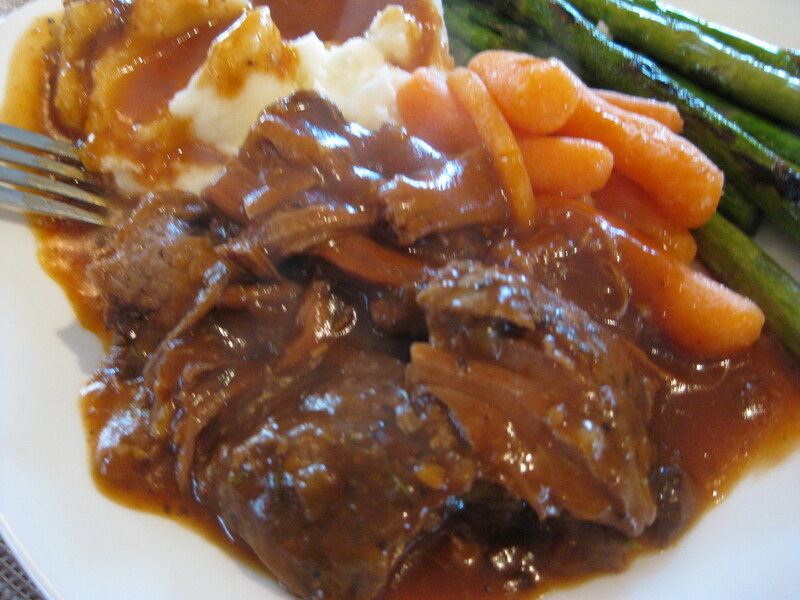 For any leftovers – place meat back in the gravy to store. Since my daughter is celiac, many of my recipes are gluten-free or at least easily adapted to gluten-free. One of my discoveries since I started cooking gluten-free was potato flour as a thickener. Potato flour is NOT potato starch – they are quite different. Unfortunately, to add to the confusion, the potato flour sold in a box in our grocery stores is really potato starch – very white and very fine. Potato flour is creamy in colour and coarser than the starch. It mixes easily with liquids – simply sprinkle the potato flour over whatever you wish to thicken – and most people will have no idea that you did not use regular flour. I have come to prefer potato flour for thickening gravies – simmer any liquid you have added it to to cook the raw potato taste out. You will need to go to a store which sells gluten-free products to find potato flour – around here that includes health food stores, produce stands and some delis. While you are there, look at the potato flour versus potato starch and you can see the difference. Potato starch will thicken liquids but is “gummier”, ie. not as nice a consistency. It is used more in gluten-free baking. 1. Brown the roast on all sides in a little oil in a frying pan OR line a roasting pan with foil, season roast with salt and pepper or Montreal steak spice and place in 500 F oven for about 15 minutes. This is a fast and easy way to brown and seal the roast. 2. I prefer to sauté the onions in a little oil until translucent – makes the onion flavor less sharp, more mellow. Stir in garlic for last minute or two. 3. 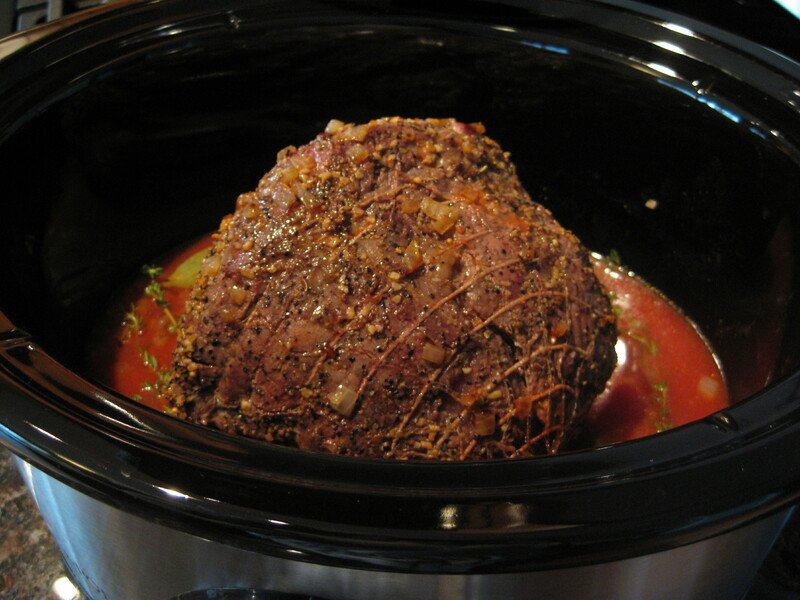 Place roast in 5 or 6 quart slow cooker. Mix onions, garlic, tomato sauce, beef broth, and salt and pour over roast. Drop in bay leaves and thyme or marjoram. 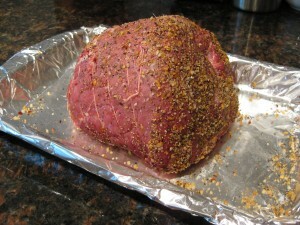 Cover and cook on LOW for 8 – 10 hours depending on size of roast. 4. Remove roast and cover with foil to keep warm. It should stand for at least 20 – 30 minutes to make it easier to cut. Some roasts will be so tender that all you can do is cut chunks!! 5. Heat beef broth (microwave) and add to gravy in slow cooker. Slowly whisk in potato flour. Cook on HIGH until thickened and bubbly. If not serving right away, place roast slices or chunks back into the gravy and keep warm. Bags of frozen prawns regularly come on sale around here – often at 2 for 1!! This makes them a fairly inexpensive meal but also very convenient as you not only don’t need to thaw them ahead of time – they shouldn’t be thawed ahead. Since we love prawns I like to find new ways of preparing them. 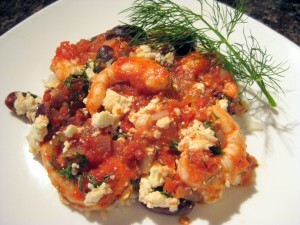 This recipe for prawns is adapted from Giada De Laurentis’ Nonna Luna’s Rice. Giada uses the smaller shrimp but we love the larger ones in this recipe. Shrimp and prawns are classified according to the number of them in one pound. I used a bag of frozen deveined prawns labeled as 41 prawns or more in the bag. The deveined prawns were unpeeled and had their tails still on. These are a bit cheaper than the peeled and also more widely available. Do not thaw the prawns until almost ready to use. To prepare the prawns, pour the frozen prawns into barely lukewarm water. After just a few minutes, the tail should pull off easily and the shell will also be easy to pull off. Remove to a colander and let them continue to thaw and drain. This would be a good job for the kids!! One key to the delicious flavour of this dish is not to overcook the prawns!! They do not need to be cooked through on the first saute as they will finish cooking in the sauce. They are done as soon as they turn pink!! We had leftovers which were delicious reheated very gently on the stovetop (so as not to overcook the prawns) with a little white wine to thin the sauce. Hmm…an idea for the next time I make this!! As you can see from the picture, this meal is more than elegant enough to entertain with and with prawns in the freezer you will be ready for last minute company!! This is one of those recipes that will take you a bit longer to make the first time but will go much quicker the next time. Have all your ingredients ready before starting to cook – the prawns will be ready by the time the rice is done!! In medium saucepan, melt butter over medium heat until hot and bubbly. Stir in rice and cook, stirring, until rice begins to brown and smells “nutty”. Pour in chicken stock and salt. Bring to a boil, reduce heat to low, cover and let simmer very gently until rice is tender – about 15 to 20 minutes. Remove from heat and let rest about 5 more minutes. Thaw prawns in barely lukewarm water until you can easily remove the tails and shells. Remove to a colander to continue thawing. Meanwhile, melt butter in large frying pan. Add garlic and cook a minute or 2 on medium heat until fragrant – do not brown. Turn heat to medium high, add prawns and 1/4 cup lemon juice then sauté the prawns until they are turning pink. It is not necessary to cook the prawns all the way through – remove to a plate with a slotted spoon leaving all liquids in the frying pan. Add whipping cream and hot sauce. Bring the cream to a boil and reduce by about half. Taste and add additional lemon juice if desired. Mix 1 tsp. cornstarch with a little water and stir into the cream. Bring back to a boil – check consistency and add a little more cornstarch if desired. Stir prawns back into the sauce and heat through. Sprinkle with freshly ground pepper. Serve over the rice with a simple steamed vegetable. The sauce will go very nicely with the vegetable as well. The shepherd’s pie I remember from my childhood was made from ground up leftover roast beef and leftover gravy. My mother had a food grinder which was attached to a pull out cutting board and cranked by hand. You can still find these around. Nowadays shepherd’s pie is usually made with ground beef so we can have this delicious comfort food without having a leftover roast!! My goal in developing a recipe for shepherd’s pie was to have the meat mixture nicely moistened with gravy but not so moist that the gravy bubbles up into the mashed potatoes too much. I hope I have found the balance here. The vegetables in the middle can vary with your tastes. My aunt always used to put green beans in the middle. Peas would work well too. You could also leave the vegetables out completely and simply serve a vegetable or two on the side which might be a good option if someone has strong dislikes. 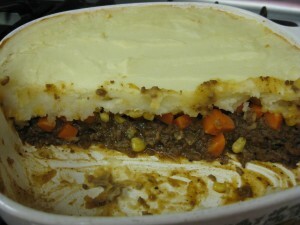 Shepherd’s Pie is a great dish to make ahead, ready to pop into the oven. Allow a few extra minutes if the dish is cold when put into the oven. Shepherd’s pie consists of a meat layer topped with a layer of mashed potatoes, sometimes with a layer of other vegetables in the middle. In a large skillet, brown beef, stirring to break up. Add onion and garlic and cook until onions have softened. Drain any excess fat. Stir in the flour, then gradually stir in broth. Bring to a boil, stirring constantly. Add remaining ingredients. Reduce heat and simmer for 15 – 30 minutes. Pour mixture into approximately 8 or 9 inch baking dish. Sprinkle meat layer with a layer of your choice of 1 or 2 vegetables: diced cooked carrots, corn, peas, etc. This is optional. Cook potatoes (and garlic cloves, if using) in salted water until very tender. Drain water and replace pan on stove. Heat to evaporate any excess moisture. Mash thoroughly. Stir in milk to desired consistency. Taste and add salt and pepper. Carefully spoon potatoes over top of vegetables; spread evenly. Bake at 350 F for 35 – 45 minutes. Chili has often gotten mixed reviews in my house, mainly due to the presence of too many kidney beans which were not a favourite. 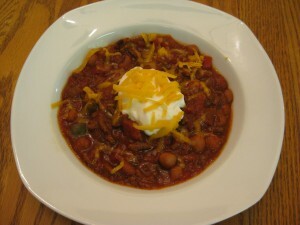 When making this recipe for chili I decided to try a can of mixed beans instead of just all kidney beans (which I don’t mind, by the way!!). Different brands will give you different mixtures of beans but usually include some kidney beans, garbanzo beans (chick peas) and pinto or white beans. 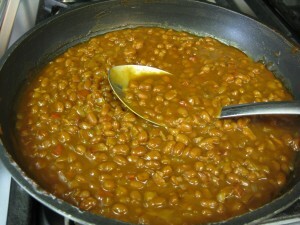 I reduced the amount of beans, adding only 1 can not 2. I also added a chopped red pepper for even more flavour and colour. Adding some tomato sauce gives this chili a really nice sauce. This recipe would easily be made vegetarian omitting the meat and adding more beans. A warning: the last time I made this chili I decided to switch up the heat by adding a chopped chipotle pepper. I tasted the uncooked chili after adding it then decided that two chipotles would be fine. Whoa! The chili was almost too hot to eat and would definitely be too hot for most children and some adults. So go easy on the chipotles! If you do open a can of chipotles in adobo for this recipe, you can freeze the leftover chipotles individually on plastic wrap then roll them up to keep them separate and put in a freezer bag. They chop easily even when frozen. Easy to put together, this is a nutritious meal in a bowl. Leftovers reheat well and could be wrapped in tortillas for tacos or burritos to create a new meal. This chili simmers all day in the slow cooker for delicious flavour. This fills my 6 quart slow cooker about ½ full so a 4 or 5 quart one should be fine. Of course, you could simply simmer this on the stovetop for a couple of hours on very low heat. For really hot chili: add one or two canned chipoltle pepper in adobo sauce, chopped fine – start with one, two is VERY hot!! In large frying pan, sauté ground beef, stirring to break it up, until browned. Add onions and continue cooking until onions are translucent but not browned. Drain off any excess fat. Meanwhile, place remaining ingredients into the slow cooker. Add the beef and onions and mix well. Cover and cook on LOW for 9 to 11 hours. Note: Chili powders can vary in flavour and hotness. Taste the chili about ½ was through cooking and add more chili powder if desired.